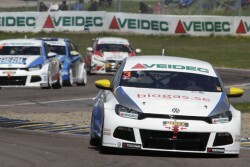 The Swedish Touring Car Championship season is off to a flying start for two racing teams driving VW Sciroccos powered by biomethane, at Swedens Mantorp Park circuit last weekend. Team biogas.se is racing in its third season, joined this year by newcomers IP Team Biogas. Both teams are fielding two cars, both running with support from Volkswagen Sweden and energy company E.ON. Johan Kristoffersson from Team biogas.se won both opening races, leading from lap one to the finish, to claim the maximum 50 championship points for the event. Team biogas.se comprises Johan Kristoffersson (1st) and Jordi Gené (6th), while IPS Team Biogas has Patrik Olsson (5th), formerly a driver withh biogas.se, and Johan Stureson (3rd), who claimed pole position for the first heat.Managers for the two teams are Tommy Kristoffersson and As Stureson respectively. “We will have common principals, but both teams will be notified to the team championship. We will stand side by side in the pits, but not in the same tents,” says Tommy Kristoffersson who in collaboration with Volkswagen Motorsport ran Team biogas.se with great success the past two seasons. The VW Motorsport Scirocco has 4 cylinders, 1998 cc, 4 valves / cylinder (ie, 16-valve), and is turbo modified and adapted to run on natural gas (biomethane). The car can reach 0-100 km/h in about 4.5 seconds and a top speed about 240 km/h.